Syrian Hamsters also known as Standard Hamsters can make wonderful pets. When raised property they are sweet and gentle. There are many nick names for them but they are all the same, Syrian Hamsters. 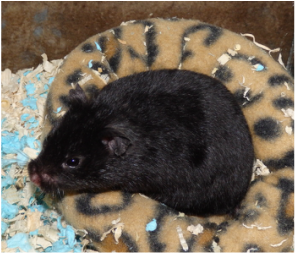 Teddy Bear (long haired), Black Bear (solid black) and Panda Bear (black and white) are all Syrian Hamsters given fancy marketing names by pet stores. Here our goal is to breed healthy hamsters with sweet dispositions. Why are we different from a pet store? Having spent 12+ years working at pet stores I can tell you the following things about pet store hamsters. #1:) The Hamsters you see at "Large Chain Stores" are all raised in mass production by a broker. Think of this broker just like a puppy mill. Where incredibly large numbers of animals are raised in tiny mass production settings with the soul purpose of financial gain. The female is bred over and over again. Usually back to back litters without a break until she can no longer reproduce the numbers for her to to be considered profitable. Once a female is no longer able to be profitable she is then disposed of. These hamsters are not raised as pets but as numbers and money. Long term health, genetic defects or temperament are rarely considered. The hamsters you see for sale are usually trucked in from locations that may not even be in your own state. Many of these hamsters die before they even reach the pet store. After years of working there, I can not in any way condone purchasing pet animals from large chain stores. Just my opinion. #2.) Small independent pet stores can really vary on hamster quality. Sometimes they have babies for sale that were brought in as "oops" litters. Sometimes they breed them. Sometimes they have their own "oops" litters. 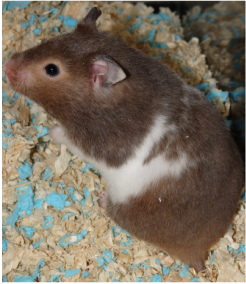 Very little is usually know about these hamsters and sometimes they have not even been socialized before you buy one. Purchase at your own risk. How are our Hamsters Different? "Captain Jack" is my boy. I sure adore him. He's sweet, gentle and easy going. He is also a SATIN! He has the most beautiful shimmering fur! 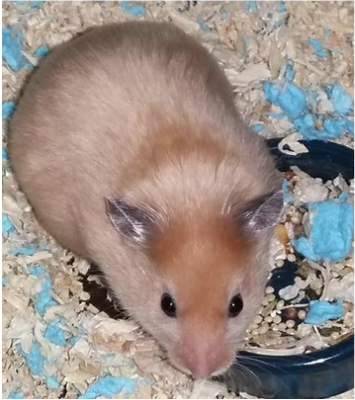 "Ham Ham" is the house hold hamster that my son named. We took her in as a baby because she was "wild" and "mean". With a little bit of TLC it seems Ham was just misunderstood and scared. She has matured into a sweet, calm and gentle girl. "Cuteness" is my son's hamster. She is hands down the sweetest, calmest and gentlest hamster I have EVER met! From the day we brought her home she was an ideal pet! I frequently sneak her out of my sons room after he is asleep to cuddle with her.